Do you often find yourself using the same stitch pattern for several projects in a row? 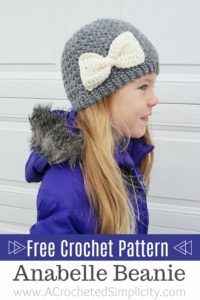 Either a new to you stitch pattern or an old favorite that you haven’t worked in quite a while? Shortly after I began designing, I started designing collections of patterns. For instance, my Chasing Chevrons patterns were my first collection using a specific stitch pattern. Just recently it was my turn to design a new square for a crochet along and I designed the Textured Twist 12″ Afghan Square (click HERE to see it). During the design process, several other coordinating pieces began running through my head, the Anabelle Beanie is one of them. I chose to use Lion Brand Yarns Touch of Alpaca for this hat. I love using the lighter worsted weight / 4 yarns and this one is no exception! Touch of Alpaca offers all the qualities you’ll find in a natural fiber yarn combined with durability and washability. This yarn is available in 16 neutral and jewel tone shades! Click HERE for the Yarn Giveaway! Enter to win before 11:59 pm CST, October 18, 2018. Yarn: Worsted Weight / 4 / Lion Brand Touch of Alpaca 90% acrylic / 10% alpaca (3.5 oz / 100 g / 207 yards / 190 m) You’ll only need 1 ball (less than 207 yards). Band Width: See the tip below for working a wider band. 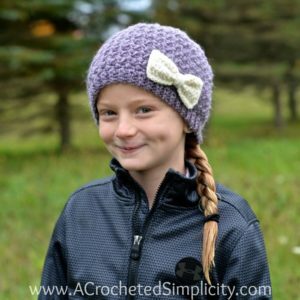 Beanie or Slouch: Instructions are included for both a beanie and slouch length hat. Turning chains are not included in stitch count unless noted otherwise. This hat is worked from the bottom up. I tend to crochet on the tighter side. You may find yourself needing to go down a hook size (or two) to properly meet gauge. You can use another WW yarn as long as it’s similar in thickness and you match gauge. I’ve found this yarn is a lighter worsted weight / 4 yarn. 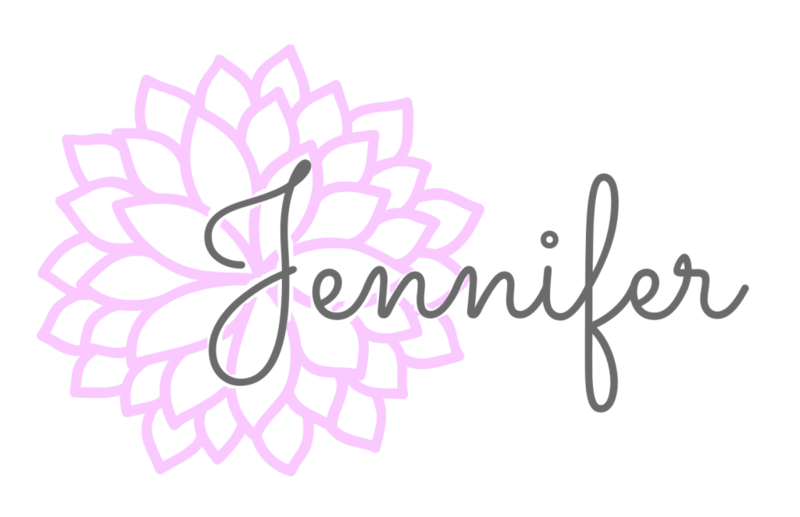 Personalized Tags for your crochet: read this blog post to find out where I purchase mine & how to add them! Mini-Bean Stitch (MBS): Insert your hook into the specified stitch, yo, pull up a loop, yo, insert your hook into the same st, yo, pull up a loop, yo, pull through all loops on your hook. Mini-Bean Stitch Decrease (MBS2tog): Insert your hook into the next stitch, yo, pull up a loop, yo, skip the next ch-1, insert your hook into the next st, yo, pull up a loop, yo, pull through all loops on your hook. *Each MBS2tog decreases stitch count by 2 stitches. 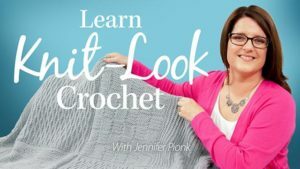 TIP: Check out this video tutorial (click HERE) that includes lots of helpful tips on working slip stitch crochet. Important Note: DO NOT (even if you’re really, really tempted to) stretch the hat band while you’re working it as this could greatly affect the positive ease of your finished band. Click HERE for a super easy way to count your rows! Tip! The band design on this hat is narrow. If you prefer a wider band, simply add more chains to the foundation chain. I made my daughter a child size slouch version of this hat and made the band 8 stitches wide instead. Do not fasten off. Continue on to Body of Hat. Rnd 2 (RS): Ch 1, MBS in the next st, (ch 1, skip the next st, MBS in the next st) rep from ( to ) around. Join. Turn. (75, 79, 85, 93 sts) *Note: you should be working a MBS in a MBS from the previous round, not in the ch-1 sps. All Sizes Beanie: Rep Rnd 2 until hat measures 4-3/4″ (5-1/4″, 6-1/4″, 7″) (including band). Do not fasten off. Continue on to Crown Shaping for the size you’re making. All Sizes Slouch: Rep Rnd 2 until hat measures 6″ (6-1/2″, 7-1/2″, 8″) (including band). Do not fasten off. Continue on to Crown Shaping for the size you’re making. Fasten off leaving an 8″ tail. Using a yarn needle, weave tail of yarn in and out of every stitch from the last round, pull gently to cinch closed. Secure with a knot on the inside of the hat. Weave in ends. Continue on to Bow, if desired. Rnd 5: Next you’ll be working around the perimeter of the rectangle, sc evenly around working 3 sts in each corner. Fasten off. Weave in ends. Continue on to Shaping & Attaching the Bow. Pinch bow in the center along the long edge, wrap yarn around the center of the bow until it’s as thick as you’d like, knot to secure. 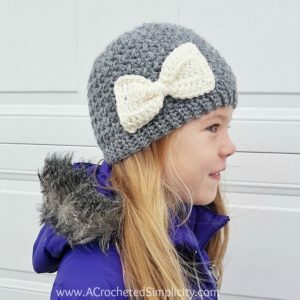 Use a yarn needle and yarn tail to sew the bow onto the hat. Tack stitch each of the 4 corners of the bow to the hat.